held at Y Stiwt in Rhosllanerchrugog. Over 150 people attended the event with many competing in the stage competitions including, individual recitation, singing, sketch, instrumental and a choir. Stephanie Greer, who’s learning Welsh at CAMU in Coleg Cambria, won first prize on the individual singing; whilst John Growcott who attends a Welsh class at Northop and Hugh Taylor who attends a Welsh class at Mold were awarded equal first prize in the instrumental competition both playing the guitar. Flintshire and the other in Wrexham. Aria comes originally from Finland and she beat over 20 other competitors with her prose on the topic ‘Conversation over the fence’. 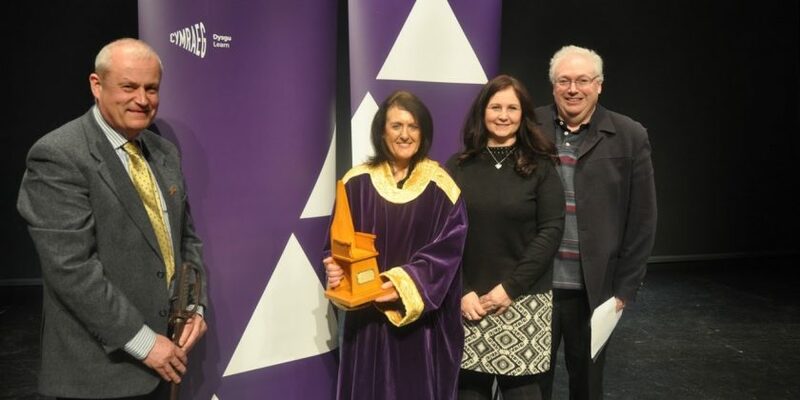 has won first prize in the National Eisteddfod on two previous occasions. Delia Bettaney from Flint won the Prose medal for her her work on the theme of Discovering, whilst Sylvia Thomas from Rhosllanerchrugog won the main prize of the evening, the chair competition with a poem entitled ‘Distance’. She was presented with a chair that was made by Carpentry and Joinery students at Coleg Cambria Bersham Road. Frances Jones, Welsh for adults manager at Coleg Cambria, said: “The level of the competition was really high again this year, and it was a pleasure to see so many Welsh learners enjoy competing and performing at the Eisteddfod.